Conservation biologist Shivani Bhalla is working to safeguard the future of Kenya's rapidly declining lion population through her innovative community outreach programs. Shivani: I'm a fourth generation Kenyan and I live in a tent in one of the most beautiful landscapes in the world, Samburu in Northern Kenya. It is here that I protect one of Kenya's most iconic species; the lion. 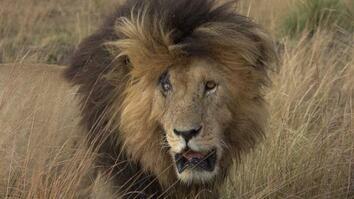 In under a century we have lost over 90% of our planet's lions. The situation in Kenya is just as serious. We are down to less than 1,000 lions in our country. What's happening? Why are we losing so many lions? In Northern Kenya, where I live and work, lions are running out of space. As human numbers increase and more livestock comes along, there's more pressure that's being put on lions. Unfortunately, when this happens, lions go out, they come into close contact with the local people and they cause conflict. Livestock such as camels, donkeys, cows, they're much easier to kill than a wild animal, like an impala or a gazelle. This happens often in our area. Lions target livestock but this causes a lot of anger and resentment amongst the local people whose livelihoods depend on this livestock. They often will go out and retaliate and they will shoot, spear or poison lions. Thanks to the Big Cats Initiative we started with five warriors and now we've grown to over 15 warriors working in this region. They have various roles. One of them is to patrol their areas. They all live in their villages, they go out during the day, they see what's in the area, they scan it. If there's predators in the area, they communicate that message back to the herders who are out there with their livestock. We've taught them how to use GPS's, so as they're herding their livestock they can tell us what they're seeing. What amazing wildlife animals they see during the day. Both sightings of predators and also tracks. You can see in this picture Precy, one of our warriors. He's got his finery, he's got his knife, his bracelets and right next to his knife is a little GPS unit with a pen. This is all our warriors. They go out dressed like this everyday. This is their normal way of life. We asked the warriors, In exchange for all this fantastic wildlife information that you give to us, what would you like in return? And they said education. We've never had that opportunity to go to school. We don't know how to read and write. We started a Sunday school with the warriors five years ago. Now I'm very excited to say that all of our warriors can read and write, both in English and our national language Kiswahili. We evaluated this program a couple of years ago to really understand how it was working in the community and we were so excited with the results. They were very positive. They showed that the local people's attitudes towards predators have greatly improved as a result of the warriors working with them. The warriors also felt much more socially empowered as a result of this project. The women came to us and they said, “You're working with warriors, you're working with elders and children. Where are we? We want to be involved in this project as well and where is our school? We want to learn how to read and write as well.” We started a Saturday school with the women just last year through a new program we have launched called Mama Simba, which means mother of lions. I'm very excited to say that just in a few months, much shorter time than the warriors learned, the women... The women learned how to read very quickly. They're very excited about it. They monitor all the predators that come to their villages at night and they write down little notes about who's come and how many times they've come in a week. We did conservation training with the women. We taught them the importance of lions and predators and why conservation is so essential in this area. We showed them the different tracks because it's all the predators that come to visit them at their villages in the evenings. The women said to us we know the tracks, we know the difference between hyena and lion and leopard tracks but we've never actually seen these animals. We've never had a close-up encounter with a lion. We hear them at night, we see their tracks but we've never seen them. We said we're gonna change this. We're gonna take you all on safari so you can get to see what tourists from all over the world get to see. Here we are. We took all the women on safari into the beautiful Samburu National Reserve. And of course, the number one animal the women wanted to see were lions. We were a little worried because by 11:00 that morning we had seen nothing, actually, and the women kept saying to us, Where are the lions? Do they really exist? We know they exist because we hear them but you keep talking about them. Where are they? We worked really hard and we were very lucky. 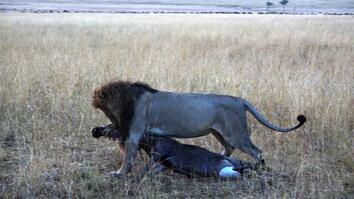 We managed to find two of our beautiful lionesses, Nanai and Nabulu, feeding on a baboon. The women were very excited watching this. At the time, Jeneria, my assistant, he was in another car. He had a lady next to him who had a little baby. The baby was getting a little bit agitated so he said to me he's gonna drive off and leave us with the lions, and he would let us know later where he is. About 10 minutes later he radioed me and he said, “Shivani, come quickly. Bring the women. Something amazing is happening.” I said, “What? What's more exciting than watching these lions eating a baboon.” He said, “Just come, trust me.” I told the women, “Hang on. We're gonna go drive to where Jeneria is.” And off we went, and we found him and right next to him was an elephant giving birth. It was an absolutely amazing experience. I have lived in Samburu for 12 years and I'd never seen this. What's even more incredible, is there's a relationship between Samburu women and elephants. As we watched this birth, the Samburu women in our cars were talking to the elephants. They were talking to them in Samburu. They were saying tomononi ai, which means-- It's an endearing way of talking to someone. They said, “We know you're in trouble, we know you and lions, you're all facing a lot of problems. Now we know and we're going to work hard to change that.” It was an incredible experience but word spread that we had shown a lot of women an elephant giving birth and we got messages from the community saying, Take us on Safari. We want to see elephants give birth. Took a lot of convincing to tell them, every time you go on safari in Samburu, you don't actually see an elephant give birth. Every year we hold Lion Kids Camps. Unfortunately, children in rural Kenya don't have positive experiences with wildlife. Most of their experiences are very negative. They get to see a cheetah killing a goat, they get to see the remains of a camel after a lion's preyed on it. They have never really experienced wildlife the way I was lucky to experience when I was a child. My parents took me on safari. I will never forget my first cheetah sighting, my first lion sighting. My first cheetah sighting happened to be in Samburu when I was just eight years old. That has stayed in my mind and that is why I do what I do. We have really invested in these children. We believe they are the future conservationists in this region. They are the future wardens, tour guides, rangers and just wildlife leaders. Our Kids Camp changes this. We bring wildlife to the children closeup. We give them a much more positive experience. Most of these children had actually never seen a lion so we show them lions. We bring them right next to these lions so they can get to see what people from all over the world get to see. These two little kids-- This picture was taken just a couple of weeks ago at our second annual Kids Camp. These little kids, Saiwana and Ltonos they were sitting next to me and they were saying, “We really can't wait to see our first lion, and we did.” We were actually very lucky. We saw 10 lions that day. At the back in the picture you'll see a little brown blob and that's actually a big male lion. These little kids saw him and their faces say it all. This is the first ever lion they've seen and they kept whispering to me, Simba, simba, and this is what gives us hope. Loirish is a lion we monitored in 2008. He was the father of many cubs in both Samburu and Buffalo Springs Reserves. He had control over two prides. Unfortunately, Loirish got into a lot of trouble last year. He was leaving the safety of the parks and going out and killing a lot of livestock. He killed more than 10 camels just in three months. We were very worried about this. We said we have to put a collar on him now and so we can really monitor his movements. Every time he leaves we will be able to see that he's out there approaching livestock, we could warn the herders. This is Letoiye, one of our warriors, and Loirish was his lion. He was looking after Loirish. Unfortunately we were not given much time. Loirish was killed last year in September. His head was cut off, his legs were cut off and his head was burned so they would remove the signs of the collar. Letoiye, who is in this picture, he for weeks was in camp saying to himself and talking to all of us saying, My warriors killed my lion. How could that have happened? I will make sure this doesn't happen again. This was devastating for our project but everyone was even more determined to make sure that our lions don't have the same fate that Loirish had. On a more hopeful note, Naramat who is a female that we hadn't seen for many years, for about three years. We were driving through Samburu last year. We heard the guinea fowl squawking. We knew there was a predator in the area and we saw this female. Jeneria and I, we know the lions very well. It takes us a couple of seconds to identify them but in this case we were stunned. We're like, Who is this lion? We pulled out our ID books, our iPads which has all the sketches of the lions, their ears, their whisker spots, and finally we identified her. We said, Wow this is Naramat. She left three years ago. Where has she been? This is where she's been. She had been outside the parks. She was surviving with the local people and what's even more exciting, she came back with a little male cub. A little one year old male cub who we named Lentim. This shows that lions do survive outside with the local people. I get asked this question a lot. “Is there a future for lions in Northern Kenya?” Absolutely there's a future. Our work has shown that. We had 11 lions a decade ago and now we're monitoring over 50 lions in our area. It's because of the local people's involvement. 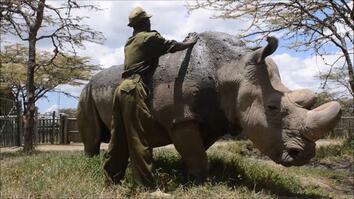 With them invested in conservation, there's definitely a hope. We have an event which we have every year. It's the Running for Lions half marathon and now the local people are running in the name of lions. Every year the number of participants increase. I think they hear that the prizes are very exciting. It's prizes of goats. So the number of people keep coming and women too. For the last three years we've had more than 20 women come to run for lions. This is our camp, our field base camp in the Westgate Conservancy in Samburu. It's an open area, it's very remote. We have no running water, no power, no internet, no phones. We have wildlife walking through. We have one little animal that's not very wild. He's a little dog. Keeps us very well entertained in camp. It's in this camp seven years ago that we set up base. For many years we actually never heard lions in our camp but now over the past year, we can hear lions in our camp, and this is incredible. This is because they feel safer. The people are much more willing to live with lions, they're tolerant of them and now lions feel that. They feel safer and we can hear them at night. Today, I ask you. I ask you to support these initiatives that are ongoing in Africa, and to spread the word about the lion crisis. We then have hope that we will continue to hear lions throughout the African wilderness for generations to come. In Samburu we say ashe oleng. Thank you very much.